Frankenstein: A monster of a different kind? For a while now I’ve been annoying people by saying that Frankenstein isn’t Gothic. 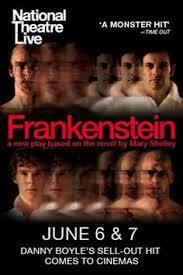 Now I’ve seen the National Theatre’s version (on film) of Frankenstein, I still don’t think it’s Gothic. More of that later, though – because it was an amazing production which plays with the text and the ideas behind it in some really thought-provoking ways. The NTLive screenings are a great way to broaden access to plays, and it’s an interesting concept anyway: although it’s filmed, you never forget that what you are watching is a theatrical production, so it doesn’t look like a film (and as a result I found it difficult not to applaud at the end!) Directed by Danny Boyle, it has elements early on which are distinctly reminiscent of the Olympic opening ceremony (which was the year after Frankenstein) and the set is innovative, turning the stage into the different settings required by the action using apparatus which appears from the floor. It seems to me there are two, linked, concepts which make the play an unusual and interesting adaptation of Mary Shelley’s book. 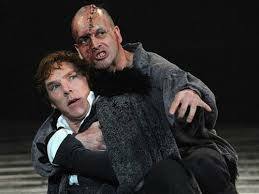 Firstly, the Creature and Dr Frankenstein are played by two actors who switched roles night after night (we saw it with Jonny Lee Miller as the Creature and Benedict Cumberbatch as Frankenstein; I can see why people went back to see the roles reversed). Secondly, as a result of this switch, the links between the two, creator and created, are much stronger than in any other adaptation I’ve seen, and thus perhaps closer to Shelley’s novel. This also means that audience sympathy is with the Creature from the start. The play simplifies the plot, doing away with some of the minor characters including the explorer Walton who tells the tale in the novel, and opens with the Creature’s ‘birth’. This is a master-stroke which sets the tone for the whole production: the opening scene sees the Creature emerge from a womb-like space and struggle to make coherent movements, uttering guttural noises and eventually delighting in his successful attempt to stand upright. As a result of watching what is essentially an adult toddler developing, and with his subsequent attempts to learn language, until he can converse and even recite Paradise Lost, it’s impossible not to see his potential and to be rooting for him despite his hideous appearance. His delight in the stars, in rain, in food, language, poetry and movement are irresistible and utterly believable. Yet Frankenstein is, above all, a critique of humanity and the civilised world, and since his status as outsider is so clearly marked by his appearance, he is reviled, beaten and shunned wherever he goes. The greatest pain, however, is his Creator’s rejection of him, an agony manifest throughout the play though most moving at the end, when he lays bare his soul to Frankenstein. This much is evident in Shelley’s writing, but not in most adaptations of the book. As Creator, then, Frankenstein is cold, inhumane and blind to the inner beauty of what he has created. Failing to see that the Creature might be good, he only fears it and wishes to destroy it. It’s clear throughout that the real ‘monster’ is the scientist who fails to understand the beauty of human life, confessing that he doesn’t know what love is while his creature has learned that as well as the brutality of the world. As a result of the dual roles the actors play, there are moments when the movements and expressions of the two mirror each other, strengthening the concept of the bond between the two. Both are outsiders, and they are also mutually dependent, which is made most clear in the bleak conclusion of the play. 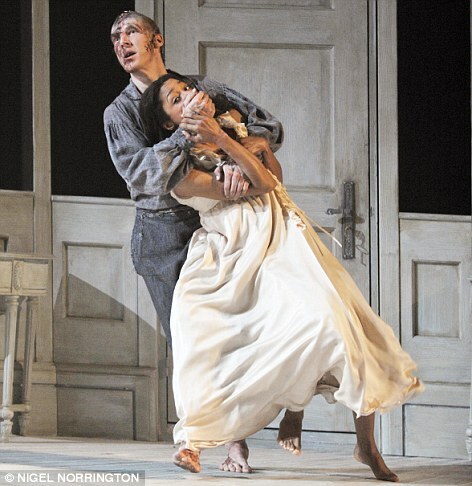 I could make a few criticisms – some slightly stilted dialogue (by far the best scenes are monologues, or dialogue between Frankenstein and his Creature), and some slightly odd casting for Frankenstein’s father, but really these things don’t matter in the sweeping movement of the play. I said that I don’t think that Frankenstein is Gothic (though I am having an ong oing argument with a student about this!) This is because it manifests so little of the traditional tropes of Gothic: it isn’t set in the past; it doesn’t have a central place as a focus for the action; it isn’t concerned with the family or heritage in the way in which Gothic normally is. However, what it does – and what this production brings out particularly well – is focus on the creation of the individual, the idea of the ‘self’ as ‘other’ – that is, it looks at how we are shaped by society, and how not conforming to society’s rules creates outsiders who are disenfranchised, and often become violent as a result. This idea of creation and selfhood is something we see in psychological Gothic, though nowhere so clearly and effectively as in Frankenstein. Shelley’s tale has taken on mythic proportions, as a seemingly endlessly adaptable metaphor relevant for all time; this play emphasises the disenfranchised outsider, with Elizabeth’s speech to the Creature focusing on her desire to support those who do not fit in perhaps over-emphasising the play’s values. The book is as much science fiction as it is Gothic, but whatever genre it is, its concern with society, science, and the myths of our own creation make it enduring. Thank you! And thanks for linking to your review, too – I absolutely agree about the lighting, too – it was magical.